Systemic Lupus Erythematosus (SLE) is a multisystem auto immune disease where the body’s immune system attacks the healthy tissues in the body. It can affect any system in the body like skin, joints, brain etc. 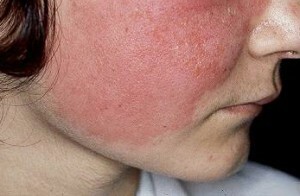 Systemic lupus erythematosus commonly affects female population more than males. However the exact cause for SLE is not known. Genetics cannot be blamed completely but individuals suffering from SLE often have someone having an autoimmune disease in the family. There are also many triggering factors in the environment like persistent exposure to ultraviolet rays, trauma, Vitamin D deficiency, any infection or virus and stress may lead to this disease. The symptoms are related and may vary to the affected system or the organ involved. Many times systemic lupus erythematosus is misdiagnosed by physicians due to tricky picture of the disease. But a thorough examination with relevant investigations done by your doctor can give you a fair idea about SLE and can be treated accordingly. How does homeopathy help in SLE? Homeopathy helps in treating SLE in many ways. It is important for a homeopath to know what is the current state of the disease in order to give a clear idea about the recovery to the patient. Lupus usually begins with constitutional symptoms like generalized weakness, erratic joint pains or some skin rash which one should be skeptical of. Homeopathy helps in controlling further progress of the disease thereby improving the quality of life of the patient. By large homeopathy provides a symptomatic relief to the patient. Relief in the skin rashes, joints pains, recurrent ulcers can be greatly achieved with proper homeopathic medication. The frequency, duration and intensity of joint pains, mouth ulcers, skin rashes and other symptoms can be decreased. Moreover the individual’s general health is also taken care of, hence, homeopathy is strongly recommended for SLE. To know more about SLE and how you can be helped with homeopathy, do get in touch with Dr Rajesh Shah at Life Force Homeopathy. You can email us at info@lifeforce.in or call us at +91-22-66888888 or contact us here. – Dr Kanchan Gohil Associate Doctor to Dr Rajesh Shah, Team Life Force.